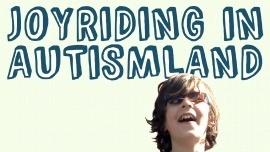 I recently re-watched and re-read autism dad Rupert Isaacson's fantastic book & documentary movie The Horse Boy so I'd be prepared to interview him on my "Joyriding in Autismland" podcast. And he wrote this one sentence in there that I had forgotten, but that totally blew me away this time: "What if [his son's] autism, instead of shutting down our lives, instead of signaling the end of all adventure, of all fun, could in fact be the gateway to the greatest adventure of all?" And it really put a blinking arrow and a fine point on how isolating it has been for us as a family to raise a kiddo on the spectrum, and how life has mostly *happened* to us (with a fury and a vengeance: 3 kids, 18 surgeries - tissue, bone, eyes, teeth, brain, and a rebellious appendix in the dead of the night). But I don't like yak butter, and I'm allergic to horses. So I thought, what if we- the 5 of us and our dog- take our Autismland staycation on the road? What if we drive from Portland to Portland (Maine to Oregon) on an epic road trip this summer, just doing fun therapies and activities with Roman (our little guy) along the way? And we film it? My youngest kiddo is delightful, funny, quirky, and has autism. My podcast focuses on the unexpected, charming, and funny moments on the spectrum.